MAKE LIKE Marie Antoinette as you flit between boudoir and salon of this grand château. It's worth inventing a family reunion or going through your address book to rack up friends to fill the 17 bedrooms. Often known as La Petite Versailles, Château de Villette was designed by Mansart and Le Notre who also designed the big Versailles. You might also spot it in the Da Vinci Code film in which it was used as as the home of Sir Leigh Teabing, a supposed historian. And the director of the film, Ron Howard has been persuaded to wax lyrical in the visitor's book. Not hard to do really as the château is a magnificent flight of 17th century fancy. In the 185 acres parklands the drama continues with a cascading water fountain similar to Louis XIV's at Chateau Marly. The owner, Olivia Hsu Decker (realtor to the stars back in Marin County USA) also owns another sublime château in Provence, Château de Grimaldi. Which leads us to ponder - owning one château is fortunate indeed, is owning two a mite greedy? Or are we just jealous? Decker says she loves to re-arrange the furniture in her chateaux so we can't promise every room will look identical to our photographs. 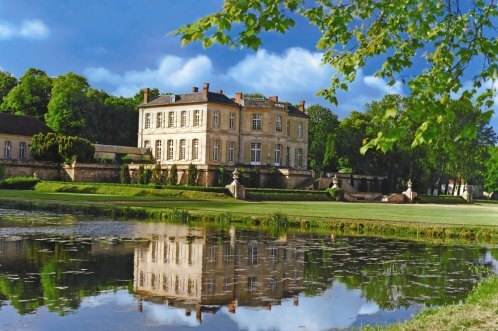 The feature of Château de Grimaldi that The Luxury Travel Bible likes best is the fact that you can swim amongst the ruins of a 17th century palace but sleep in high nobility in one of the 11 bedrooms. The château has been superbly spruced up with a mix of formal antiques and more casual French pieces. There are also a series of party provoking venue alternatives inside the 12 acres parklands - including the chapel, the stone cellar wine bar and 'disco' and stone terraces. Should Olivia's impressive array of antiques inspire you to take some home, the château is just a skip from the shopping haunts of Aix-en-Provence.